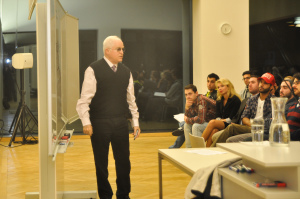 Economic Value Added or EVA ® is a topic any LBS student routinely comes across in his/her finance classes. Meeting the man who created EVA ® was, however, a unique encounter for our students and faculty members alike. Joel Stern, founder and CEO of Stern Stewart & Co. and Stern Value Management spent several days at LBS, meeting students, joining classes, talking to faculty, and gaining an insight into the vibrant campus life. 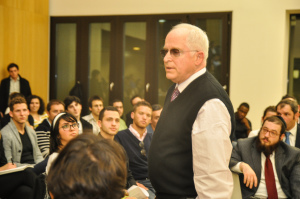 Professor Stern, who studied with several Nobel Prize laureates at the University of Chicago (Merton Miller was particularly influential) and later taught at some of the world’s finest business school (inter alia he is a faculty member of Columbia Business School), counts as one of the leading authorities on financial economics, corporate performance measurement and shareholder value concepts. His distinguished career trajectory started at Chase Manhattan Bank. Since the early 1980s, Joel Stern has introduced trail-blazing innovations in the realms of valuation models (Free Cash Flow), on the basis of which he later developed the alternate approach of Economic Value Added. 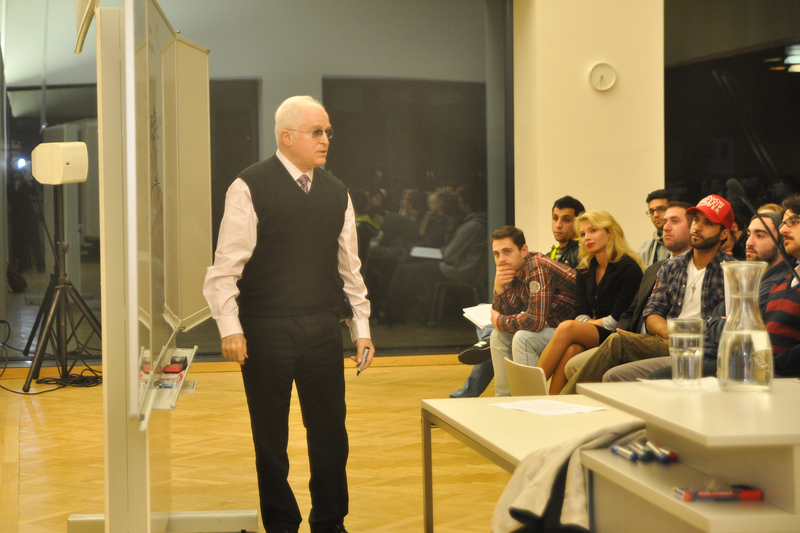 Professor Stern has always been on the forefront of academia, corporate and government consultancy as well as public debate, as is evident in his numerous media appearances in global business media outlets (e.g. Bloomberg TV, Financial Times, Wall Street Journal, New York Times). The core of this outstanding visit to LBS was Joel Stern’s talk on “How the Theories of Modern Finance Solve the Corporate Governance Problem”. 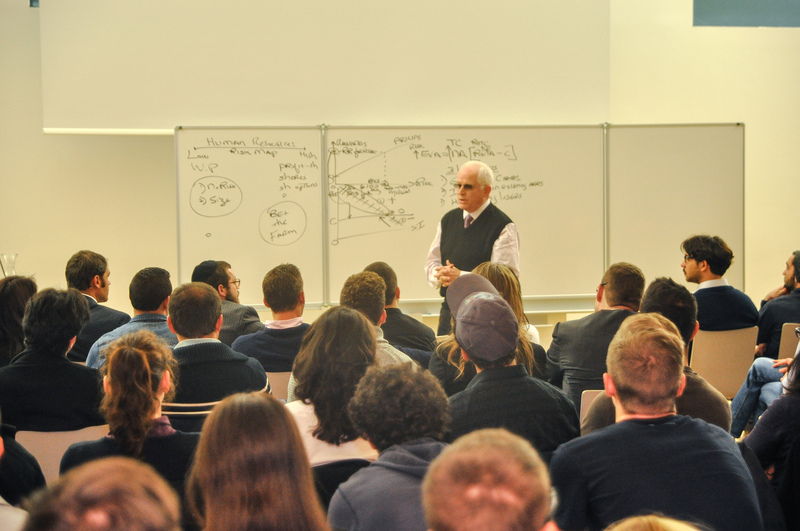 A huge number of students was fascinated by Professor Stern’s engaging lecture on the added value of EVA ® for corporate governance. One could sense that Professor Stern not only frequently advises some of the world’s major companies (in total almost 900) but knows how to spark the curiosity of a student audience, to challenge their conventional wisdoms and to inspire their financial thinking. On the example of several company cases which decided to implement EVA ® (among them numerous family businesses), Joel Stern demonstrated how important it was to make employees feel as if they own what they do in the company. A bonus bank system incentivizes employees to enjoy long-term benefits while contributing to increased shareholder value. LBS will continue to further boost its competence in financial subjects. Hosting Professor Stern at the onset of this endeavor doubtlessly represented an opportunity which was second to none.